reporter the newsworthiness of a particular person, event, service or product. 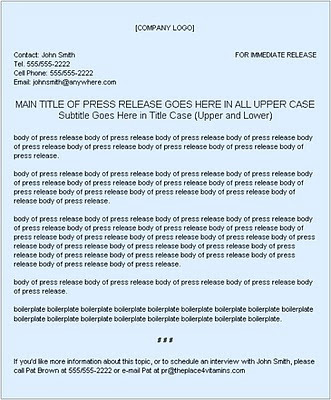 How is a press release used? or may be accompanied by a pitch letter. 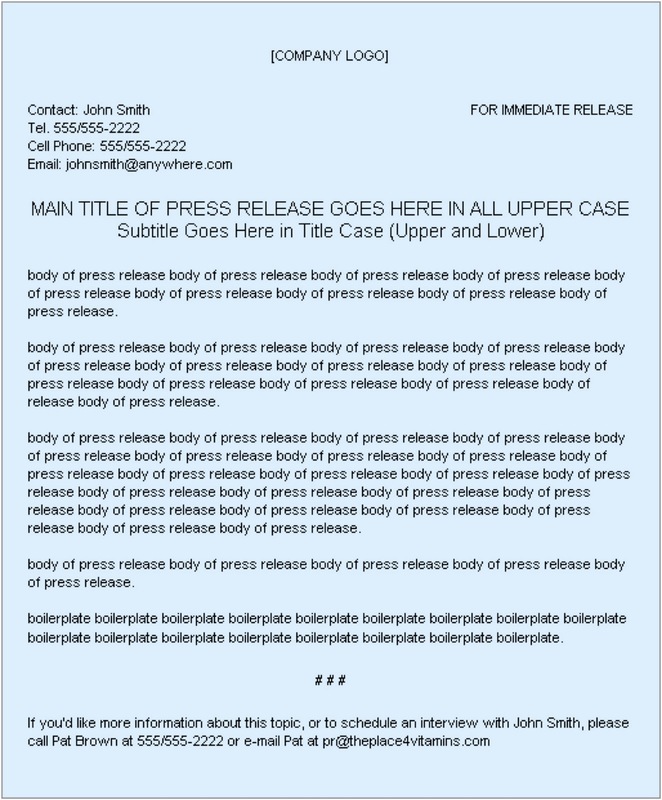 What is the proper press release format? Let's stick with the theme: you run an vitamin web site specializing in weight-loss products. Through the process described in the report, you've nailed down a nice, newsworthy topic – teenagers and how they deal with issues of weight. But that's a broad topic, not a story. In the report, we provided a number of ideas for potential stories. Let's pick the first one and craft a press release. The story: What do kids think about a "thin is in" society? As you sift through your message boards looking for quotes, you see a trend appearing. There are lots of messages criticizing Hollywood actresses and pop singers for being too thin. Many girls are saying that seeing these women make them feel bad about their own bodies. A number of the boys are pointing out that they don't find ultra-thin women appealing. Teenagers think that a "thin is in" society pretty much stinks. The reporter isn't interested in helping you make money or driving visitors to your site. He's looking for a story that will be interesting to his readers and pleasing to his editor. He could care less about your great selection, super customer service and commitment to quality. He wants to know only the info that will help him craft a good story about teens and their weight. Take your ego out of it. Take your natural inclination to sell, sell, sell out of it. Look at your story with a cold, objective eye. OK, let's get to our press release headline. State your most exciting news, finding or announcement in as few words as possible. Emulate the headlines you see in the newspaper every day. Don't worry, you'll get to plug your website soon enough. In the meantime, you've just thrown a meaty hook at the reporter. It's Journalism 101 -- the lead paragraph includes the who, what, when, where and how of the story. If the reporter were only to read the lead of a good press release, he'd have everything he needed to get started. There's no room for BS, hype or sell. Just the facts. America's teenagers are angry at Hollywood for glamorizing ultra-thin bodies, and many girls say they feel too selfconscious about their bodies as a result of watching TV, movies and music videos. The findings are gleaned from more than six months of ongoing discussion and debate at the website theplace4vitamins.com. According to theplace4vitamins.com President John Smith, anger and resentment toward the Hollywood ultra-thin runs deep, particularly among teenage girls. "This demonstrates once again the need to teach young girls and boys about how to develop a positive self-image,"said Jane Doe, author of "I Like My Body Just As It Is". "theplace4vitamins.com has done a true service by bringing these attitudes to the public's attention." herbal products. The site offers a range of articles, research materials and message forums for the health conscious consumer. This paragraph is known as the "boilerplate" -- an old newspaper term meaning a block of standard text that's used over and over again (e.g. the explanation of symbols on the stock price page). In this case, it's text that you might use at the bottom of all your releases. Place your boilerplate right above the # # #'s. * Stay away from hype-bloated phrases like "breakthrough", "unique", "state-of-the-art", etc. * Always write it from a journalist's perspective. Never use "I" or "we" unless it's in a quote. * Read lots of good newspaper writing, such as the New York Times or the Washington Post to get a feel for the style. * Shorter is better. If you can say it in two pages, great. If you can say it in one page, better.